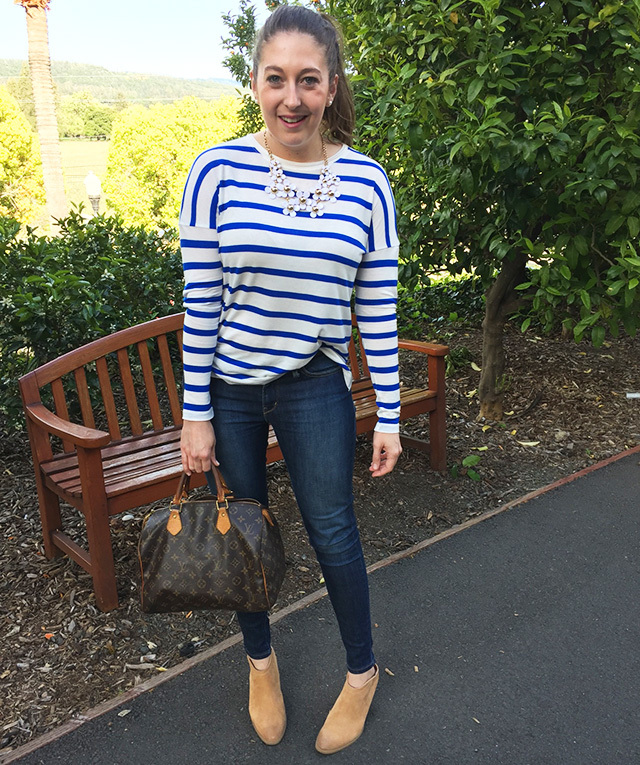 Denim and Stripes! 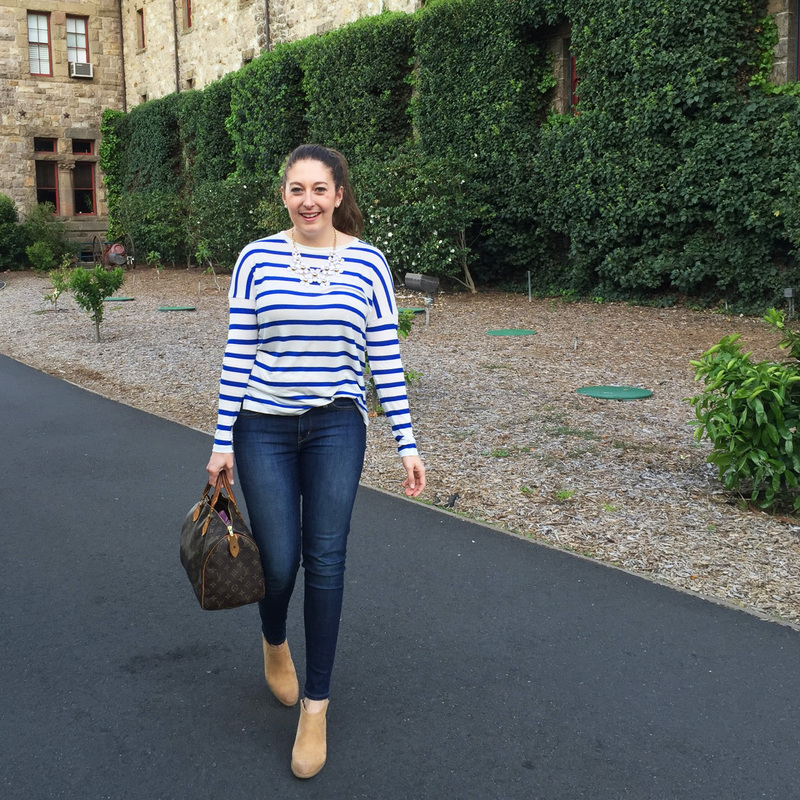 Magnolias and Sunlight: Denim and Stripes! Sometimes you just need a comfy outfit! 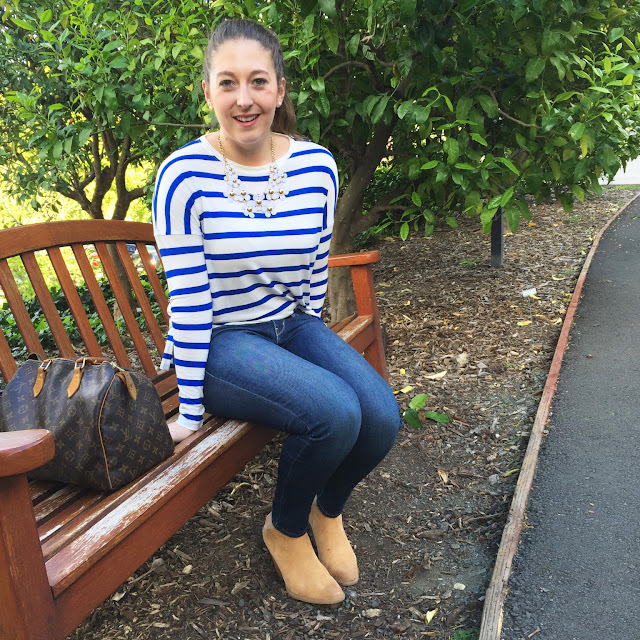 I found this striped shirt at Nordstrom Rack and I loved it. It's always great when you find something you love on the clearance rack! Of course, that means I couldn't find an exact match for you, but I love all of the similar options especially this split-back one! Also, if you're looking for a pair of booties I highly recommend this pair from Target! They look a lot like the Dolce Vita 'Noa' Booties, but have a closed toe, are much cheaper and they're available. 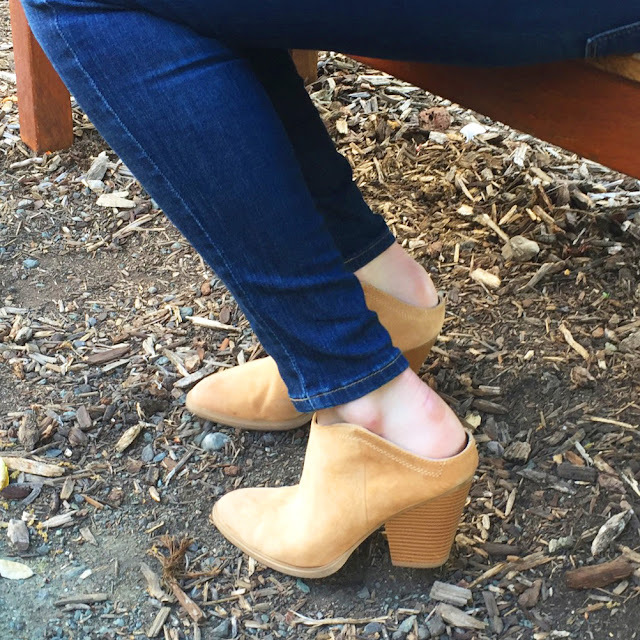 I loved the 'Noa' bootie, but it sold out in my size really fast! The DV pair from Target comes in black, too. You can get both and still spend less than the one pair (of course these aren't real leather). Last summer I picked this flower necklace up at Charming Charlie. I've worn it so many times! 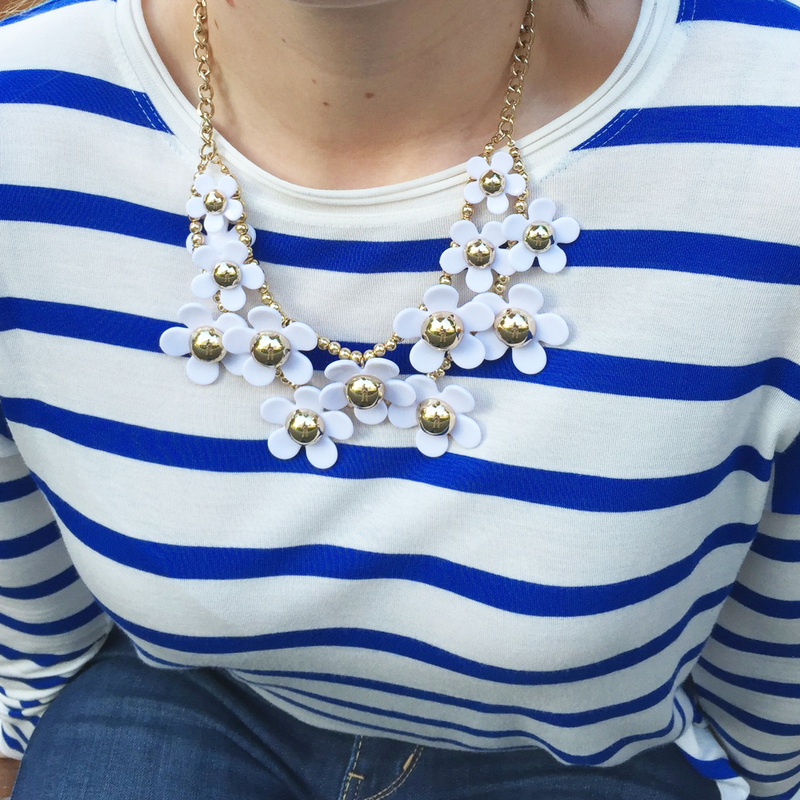 It's a statement necklace, but the white and gold make it really easy to pair with just about anything. Baublebar has a ton of plastic flower necklaces and Charming Charlie released a few similar options again this year. These Geranium Earrings are really popular, too. They give you a similar look, if you're not wanting to wear a necklace. I chose to wear my go-to pearls. I like to stick to the one statement accessory per outfit! Thanks, Brian! 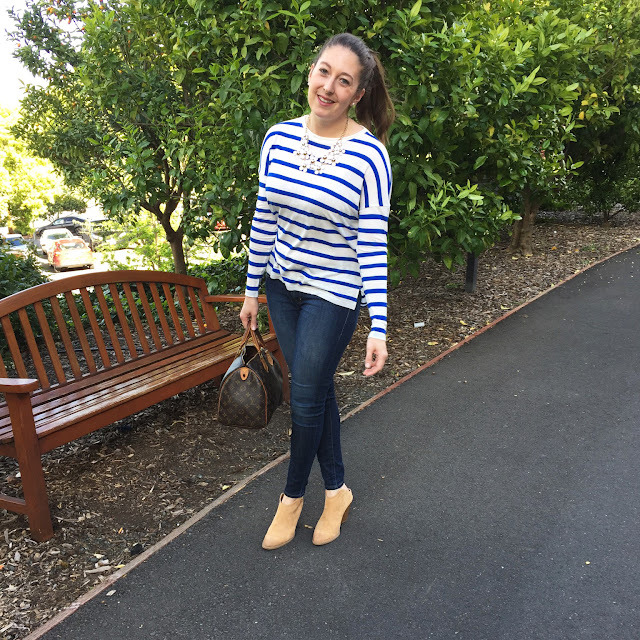 I've been loving stripes recently!! A tisket, A tasket, Making an Easter Basket! Neutrals and a Hint of Turquoise! What's in my March PopSugar box? Tips for Stretching your Shopping Budget! Warm Sweaters in the Spring! Spring Break: Snow Bunny Status!